TSLPRB SI, ASI Results 2018 Declared for PMT, PET Exams: Telanagana State Police Recruitment Board, TSLPRB has released the results for the SCT SI PWT Results 2018. The examination as conducted on August 26, 2018. TSLPRB SI Results 2018 are now available on tslprb.in. The announcement was made on September 16, 2018 on the official website. Candidates can check the results online now on the link provided. TSLPRB has also released the Final Answer Keys. TSLPRB had released the preliminary answer keys on August 27, 2018. Candidates would submit objections till August 29, 2018. Based on the objections received, the Final Answer Keys have been released. Please note, the results are based on the final answer keys that are now available on tslprb.in. The Schedule for filling-in the Part-II Online Application Form will be informed in due course. Candidates who are declared qualified in the Preliminary Written Tests have to visit the website www.tslprb.in for uploading the Part-II Application along with scanned copies of the required Certificates / Documents as elaborated in Para 6. Instructions to Candidates for Filling the Part-II Online Application Form and Uploading in the Notification. It may please be noted that the Data / Information provided by the Candidates and the Certificates / Documents uploaded by them while filling-in their Part-II Online Application will be considered as final and no further changes will be allowed. For all the relevant Candidates pertaining to the Notification Nos. 88, 89, 90 and 91 / Rect./ Admn-1 / 2018 dated 31-05-2018, the Physical Measurement Test and Physical Efficiency Test will be conducted only once, as mentioned in Para 3. Fee Structure (b) of the Notification, as per the procedure and rules described in Para 17. Selection Procedure / Scheme - B) Physical Measurements Test (PMT) and C) Physical Efficiency Test (PET) of the Notification. TS SI Results: A total of 1,88,715 candidates had enrolled for the examination and 1,88482 candidates had appeared for the examination. A total of 1,77,992 OMR sheets were evaluated. Out of which, 1,10,635 candidates have qualified for the subsequent rounds. So, Out of the 1,77,992 candidates who appeared in the exam, 1,10,635 qualified for the next stage of the examination (PMT/PET). The Schedule for filling-in the Part-II online application form will be informed in the due course. Check the important instructions regarding candidates who have qualified on its website. 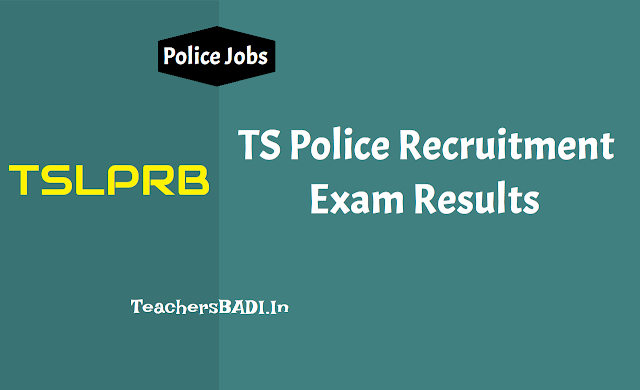 TS Police SI Result 2018 declared at tslprb.in: Telangana state level police recruitment board (TSLPRB) has declared the result of the examination to recruit Stipendiary Cadet Trainee (SCT) Sub Inspector (SI) of Police (civil) and some other equivalent posts. The preliminary written test (PWT) to fill 1,217 tentative vacancies was conducted on August 26 in which 1,77,992 candidates appeared. The preliminary answer keys were released on August 27 and candidates could raise objections until 5pm on August 29. OMR Sheets of the candidates who appeared in preliminary written test was evaluated and the list of qualified candidates drawn on that basis.